SPRINGFIELD - With the beginning of the spring season starting out in less than favorable weather conditions, many teams had no choice but to postpone some games, while left scrambling to find suitable make-up dates. Which brings us to Pope Francis. Fair or unfair, the Cardinals were thrown into the fire this week. Beginning on Monday, a bit of re-shuffling of the schedule had them playing four games in four days. Apparently Pope Francis athletic director John Goda must think Cardinals coach Pat Moriarty has enough arms within his pitching rotation to pile this many games on top of one another, instead of spreading them out over the next few weeks. Pope Francis has just three pitchers that it can honesty rely on, and all were used heavily earlier in the week. Facing St. John's (Shrewsbury) on Thursday marked Pope Francis' fourth game of this span. It also marked a meeting between two Super 8 clubs from a year ago. Fresh off a heart-breaking walk-off loss at Minnechaug late Wednesday night, the turnaround for the Cardinals would no doubt be brief. Moriarty had no choice but to dip into his thin well of back end hurlers, and it showed as the Pioneers rouged up four of them, en route to an easy 11-0 victory at Forest Park. St. John's (9-2) collected 11 hits and showed patience at the plate, as the Pioneers were issued nine walks. Pope Francis falls to 7-4. "We basically took what they gave us," said Pioneers coach Charlie Eppinger. "We had some nice production up and down the order, including guys coming off the bench. We are going to need all 16 of them to contribute if we are going to go as far as we would like." Cardinals starter Damon Wesley didn't get out of the second inning as he gave up two hits and walked six. By the time he departed, St. John's was already in front 2-0, courtesy of a bases-loaded walk and a hit batsman. The Pioneers added a solo tally in the third. With two out, Christian Jordan (3 hits), singled, stole second, took third on an error and scored on a balk. Tim Hurley entered for Pope Francis and got the final out. But his woes were yet to come. Again, St John's juiced the bases on a Jordan single, another hit batsman and a single by Sean Burke, who also finished with three hits. Jordan would race home on Moschello's ground out to make it a four-run contest. Jordan's RBI single in the fifth added to the Pioneers lead. In the sixth, after filling the bases once again, they scored on walk and wild pitch to make it 7-0. 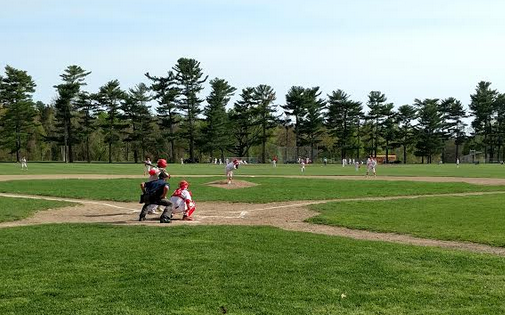 While all this was taking place, St. John's starter Matt Stansky was dominating the Cardinals. The talented senior allowed just two hits, struck out five and walked four in his six innings of work. In the second, he was able to work himself out of a bases-loaded jam without a blemish. Up and coming sophomore Nick McDonald pitched the seventh and struck out all three batters he faced. "I was just getting out there and throwing," said Stansky, a right-hander. "In the last couple of starts I had trouble getting through innings. Today I was able to settle in for the most part. I tried hitting my spots as best I could. We have a good defense so it puts me at ease knowing they're going to make the plays behind me. Starting out with the lead like today gets my confidence going and I feel I can go out and throw strikes." With the game getting out of hand, Jake Leahy was brought on in the sixth to replace Hurley in an attempt to stop the bleeding. However, the right-hander ran into problems in the seventh. Singles by Bailey Mikule and Jack Gardner were followed by a walk to Burke. Jack Herlihy came off the bench to pinch-hit and stroked a two-run single into left. With Tim Sears now on the mound, St. John's plated a pair more on a hit by pitch and a SAC fly. "I though Matt was excellent for us today on the mound and was around the strike zone throughout," Eppinger said. "Pope Francis had a tough week. Four games in four days is tough on anyone. I know that team is a lot better than what we saw today and I think they are going to make some noise in whichever tournament they end up in." For the game, the Pioneers were on base throughout and left 13 stranded. "We were really thin pitching-wise today," said Moriarty. "Credit to St. John's. They are a great team and are very well-coached. We are looking forward to having the next two days off to catch our breath and then we have another three games next week. After we left the bases-loaded in the second and didn't score it took some of the wind out of our sails."